High-quality Pet Studio Dazzling Dog Collar Charms offer elegant accessories for the truly upscale pet. This dog collar pendant base material is dazzling nickel. This Dazzling Dog Collar Charms will attach easily and securely to collars with a 1/2" split ring. 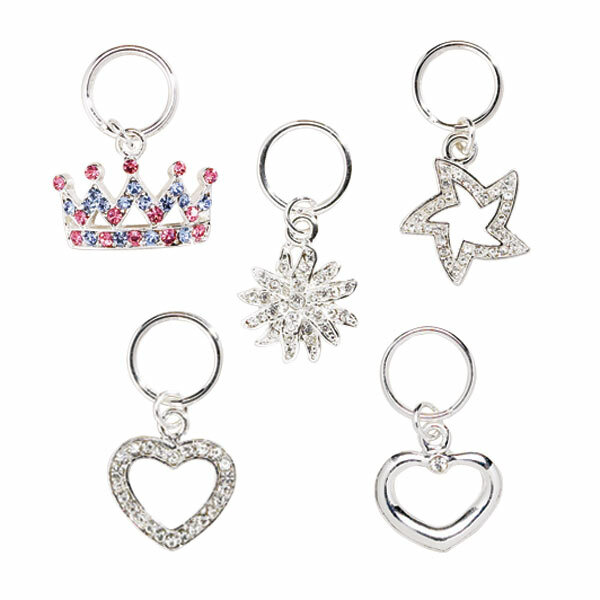 Dazzling Dog Collar Charm Options described below. Crystal Crown measures 7/8" x 5/8"
Crystal Flower measures 5/8" x 5/8"
Crystal Open Star measures 3/4" x 3/4"
Crystal Open Heart measures 5/8" x 5/8"
Open Heart measures 5/8" x 5/8"